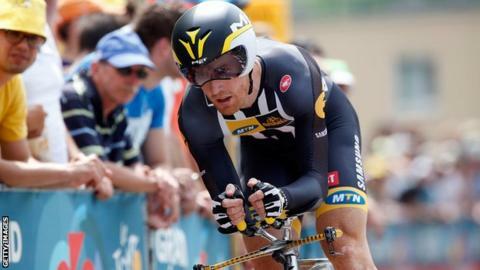 American sprinter Tyler Farrar had to borrow a spectator's bike and cycling shoes after suffering a crash on the third stage of the Tour Down Under. Team Dimension Data's Farrar, 31, was one of several to fall as riders descended at high speed before a key climb towards Campbelltown, Australia. When Richie Porte borrowed a rival's wheel at the Giro d'Italia last year, the Team Sky rider was penalised as rules state only team-mates may help. But Farrar escaped any such action. Instead, a post on the Tour Down Under Twitter page appeared to commend the fan: "Now this is a great story. Let us know when the spectator makes himself known!" The Adelaide Advertiser reported that it was a 42-year-old New Zealander who came to Farrar's aid, with no support vehicles in sight. Australian Simon Gerrans of Orica GreenEdge leads the six-stage race, which concludes on Sunday.